The term - Meltdown - refers to melting of the fuel in the reactor. Unfortunately, the term has been loosely applied to refer to any case of fuel melting, however minor. Only in several events - Three Mile Island 2 and Chernobyl - has there been significant fuel melting and only in the case of Chernobyl were there significant offsite releases. Such conditions are considered to be outside the design basis for nuclear plants and are referred to as Class 9 accidents. The design of the plants is intended to assure that such conditions do not occur - due to the redundancy and diversity of the reactor protection, emergency core cooling, and containment isolation systems, as well as the containment structure itself. In spite of this, the US Nuclear Regulatory Commission is requiring licensees to develop procedures for such cases. The procedures are referred to as Severe Accident Guidelines. Failure of the containment isolation systems, lines, and valves to close. Generation of gases either due to hydrogen generated from a chemical reaction between Zircaloy (used in the fuel cladding) and steam at temperatures above 3400F or due to carbon dioxide generated from interaction of molten core material with the concrete structures under the reactor. Heating of the containment atmosphere due to a failure of the containment cooling and spray systems. Specialized high efficiency particulate, absolute, and charcoal filters do not function as required. A meltdown occurs when fuel has overheated, melted, and flowed to the bottom of the reactor vessel, where it will burn its way through the steel and then collect on the floor of the primary containment structure. It is possible to have a meltdown without a loss of primary containment; the containment is designed to hold the melted fuel and its radioactive emissions. A loss of primary containment occurs when the integrity of the containment structure is compromised, allowing the melted fuel and/or radioactive isotopes to leak into the secondary containment. The loss of secondary containment would allow the melted fuel and/or radioactive isotopes to escape to the outside environment. 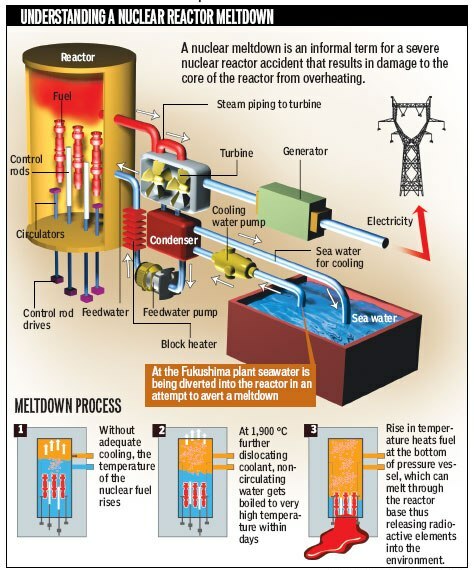 “Meltdown” refers to damage to fuel rods due to excessive heating when the reactor’s cooling systems fail. Because of their high level of radioactivity, fuel rods in a reactor core or a spent fuel pool generate a lot of heat even if the reactor is not operating. So they must be surrounded by water that is circulated and cooled to carry heat away from the rods. If something disrupts this cooling, the fuel rods will heat up the water and eventually cause it to boil off. A partial meltdown will release large amounts of radioactivity. In general, that radioactivity and the damaged fuel will be contained in the steel reactor vessel, which is itself in the reactor’s “primary containment” structure to isolate it from the environment. That means that even if a partial meltdown occurs, it may not lead to a large release of radioactivity into the atmosphere since it will be confined inside the reactor. That is the situation that occurred during the Three Mile Island nuclear accident in 1979. However, if a partial meltdown occurs in spent fuel that is not in the reactor core but has been moved to the spent fuel pool, the radiation released is much more likely to get into the atmosphere. The pool is not surrounded by the same layers of confinement as the reactor. In the case of the Japanese reactors, explosions have damaged the reactor buildings and that would allow radioactive gases from the spent fuel pool to travel directly into the atmosphere. 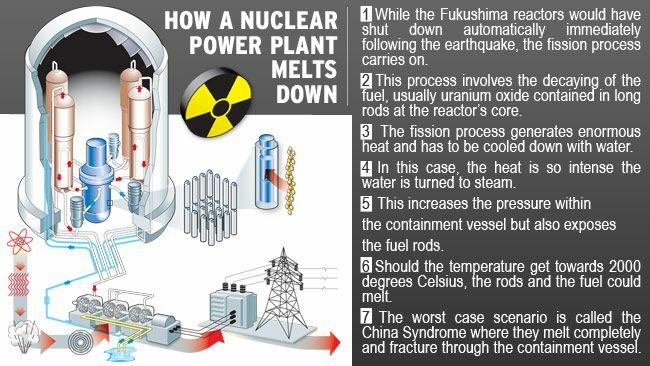 A “complete meltdown” can occur when cooling water drops enough that the nuclear fuel in the reactor core is entirely uncovered. If a large quantity of fuel melts, the molten mass can run to the bottom of the metal reactor vessel, and may remain hot enough to burn through the vessel floor. The mass would then drop onto the concrete floor of the primary containment. In the case of the Mark I containment used in the Japanese reactors, if the mass is large enough it can spread to the metal containment wall and burn through it. If so, the containment can be breached and radioactivity will escape. The concern about a full meltdown in the reactor is that it will potentially breach the primary containment structure, which would greatly increase the probability that it would escape into the atmosphere. This is different for spent fuel pools. Since the pools are already outside primary containment, a complete meltdown would not necessarily be significantly worse than a partial meltdown, although the total amount of radioactive gases released would likely be largerin the former case. Background radiation - The radiation in the natural environment, including cosmic rays and radiation from the naturally radioactive elements, both outside and inside the bodies of humans and animals. The usually quoted average individual exposure from background radiation is 300 millirem per year. Cladding - The thin-walled metal tube that forms the outer jacket of a nuclear fuel rod. It prevents the corrosion of the fuel by the coolant and the release of fission products in the coolants. Aluminum, stainless steel and zirconium alloys are common cladding materials. Emergency feedwater system - Backup feedwater supply used during nuclear plant startup and shutdown; also known as auxiliary feedwater. Fuel rod - A long, slender tube that holds fuel (fissionable material) for nuclear reactor use. Fuel rods are assembled into bundles called fuel elements or fuel assemblies, which are loaded individually into the reactor core. Containment - The gas-tight shell or other enclosure around a reactor to confine fission products that otherwise might be released to the atmosphere in the event of an accident. Coolant - A substance circulated through a nuclear reactor to remove or transfer heat. The most commonly used coolant in the U.S. is water. Other coolants include air, carbon dioxide, and helium. Core - The central portion of a nuclear reactor containing the fuel elements, and control rods. Decay heat - The heat produced by the decay of radioactive fission products after the reactor has been shut down. Decontamination - The reduction or removal of contaminating radioactive material from a structure, area, object, or person. Decontamination may be accomplished by (1) treating the surface to remove or decrease the contamination; (2) letting the material stand so that the radioactivity is decreased by natural decay; and (3) covering the contamination to shield the radiation emitted. Feedwater - Water supplied to the steam generator that removes heat from the fuel rods by boiling and becoming steam. The steam then becomes the driving force for the turbine generator. Nuclear Reactor - A device in which nuclear fission may be sustained and controlled in a self-supporting nuclear reaction. There are several varieties, but all incorporate certain features, such as fissionable material or fuel, a moderating material (to control the reaction), a reflector to conserve escaping neutrons, provisions for removal of heat, measuring and controlling instruments, and protective devices. Pressure Vessel - A strong-walled container housing the core of most types of power reactors. Pressurizer - A tank or vessel that controls the pressure in a certain type of nuclear reactor. Primary System - The cooling system used to remove energy from the reactor core and transfer that energy either directly or indirectly to the steam turbine. Radiation - Particles (alpha, beta, neutrons) or photons (gamma) emitted from the nucleus of an unstable atom as a result of radioactive decay. Secondary System - The steam generator tubes, steam turbine, condenser and associated pipes, pumps, and heaters used to convert the heat energy of the reactor coolant system into mechanical energy for electrical generation. Steam Generator - The heat exchanger used in some reactor designs to transfer heat from the primary (reactor coolant) system to the secondary (steam) system. This design permits heat exchange with little or no contamination of the secondary system equipment. Turbine - A rotary engine made with a series of curved vanes on a rotating shaft. Usually turned by water or steam. Turbines are considered to be the most economical means to turn large electrical generators.